The Zone of Silence is one of those subjects that cause scientists to lose their patience with believers in UFOs and the supernatural. It is surely one of our planet’s natural wonders, and far from being in some obscure part of the world, it is some four hundred miles from the U.S. border and even marked on the AAA road maps (although drug trafficking concerns would make the trip unadvisable). 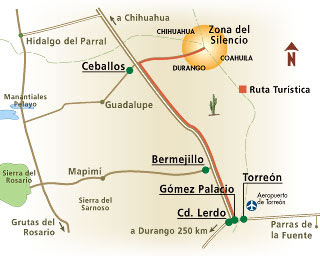 Its owes its suggestive name – which even inspired a horror movie called La Zona del Silencio directed by Rodolfo de Anda in 2004 – to the fact that magnetic aberrations make radio communications impossible in certain parts of the area, which is formally known as the Vertice de Trino: the place where the borders of the Mexican states of Durango, Chihuahua and Coahuila join between the twenty-sixth and the twenty-eighth parallel. In an effort to discourage any paranormal chatter, scientists often stress the fascinating biological abnormalities found by researchers: strange reptiles and vegetation that is unique to the area, which aeons ago was underwater, as evidenced by the fossilized marine life that can be found scattered throughout the location. It is interesting to note that some official websites do not eschew mentioning the supernatural legend that has grown around the Zone of Silence, such as the belief that a region having similar characteristics must exist somewhere on the other side of the world, lost in Central Asia, a place where “earth energies” are concentrated. Even though famed Mexican aviator Francisco Sarabia first reported radio trouble while flying over the area in the 1930s, the “Zone” would probably have been another expanse of desert had it not been for engineer Harry de la Peña, an organic chemist who visited the area in 1966 on what was meant to be a photographic survey, and suddenly found himself unable to contact other members of his team on handheld radios: these devices would emit little but faint whispering sounds when cranked to full volume. 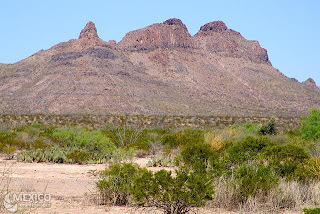 Television and cell phone reception is likewise hampered as far as Ceballos, Durango – some twenty-five miles distant -- and the outlying desert settlements. Contrary to rumor, verbal communication is not at all impeded by the forces at work in the area. Larger objects have also felt the inexplicable lure of the Zone of Silence. In the early morning hours of the eighth day of February, 1969, the desert night was turned into blinding radiance as a huge meteorite hurtled toward the hamlet of Pueblito de Allende. Locals compared the actinic whiteness of the burning meteorite as “staring into a flashbulb”. The object’s impact caused a massive shock wave that produced the single loudest sound heard in the area since modern humans have occupied it. The Allende Meteorite, as it has become known, is the largest of the “particles” attracted to this part of the world. Some of the earliest reports of UFOs in the area can be traced to eyewitness reports of incidents that occurred during the Mexican Revolution (1910-1921). One such report, collected in Prof. Santiago Garcia’s Los Ovnis en Mexico (Posada, 1972) comes from a peasant named Matías López, 79 at the time of the writing, who recalled seeing fireballs in the heaven over San Pedro, Coahuila when he was only fifteen years old. His elders said that the fireballs “were the fires of the end of the world” which would consume our planet completely, in step with some religious beliefs. Similar bolides have been reported elsewhere in Mexico, even by the military, as can be attested by the 1967 incident involving the warship Guanajuato. The object increased its brilliance and rose rapidly into the sky, becoming smaller “like a star, and then I never saw it again.” A phenomenon similar to what was described by Ms. Becerra occurred thirty-seven years later in Maxala, Guerrero, thousands of miles distant. A truly spectacular UFO sighting was reported one evening in September 1976 around 8:59 p.m. when residents of Ceballos noticed the overwhelming presence of a giant object on the outskirts of their community. At least two dozen residents gathered on Ceballos’s main street to watch the “craft” hanging in mid-air, as if waiting for its cue. The baleful machine, if machine it was, was estimated at some 300 meters long and with an overall rectangular shape. Lights surrounded the object, changing from green to blue to white, pulsating to a dull, humming sound coming from deep within its recesses. The eerie situation was made worse by all the dogs in the town suddenly howling and barking in unison. Jose Madero, an elderly and decidedly valiant local, thought the intruder might be a balloon or dirigible of some sort, and approached it. He described it as being silvery in color when seen at close range, almost like steel. Eventually, the object rose into the air and headed toward the Zone of Silence. Strangeness is not restricted to the objects that are seen in the sky by cattlemen and desert ranchers: Sometime in 1975, an enterprising couple drove into the Zone of Silence in a brand new Ford pickup to gather unusual rocks and fossils, which can be found in great abundance. As they busied themselves in their activity, they noticed that a desert rainstorm was heading toward them. Hoping to avoid getting caught in a flash flood, they wisely packed their vehicle up and sped off, but not fast enough to avoid the relentless rain: the track ahead of them turned into a swamp: the pickup was quickly trapped, and began to sink into the soft terrain. While the couple struggled to keep their vehicle from sinking, two figures approached them, waving amid the torrential rain. Two extremely tall men in yellow raincoats and caps, with unusual but by no means alarming features, offered their assistance to help them get underway again. The men instructed the totally drenched couple to get inside the pickup again while they pushed. Before the couple realized, their vehicle had popped out of the hole and on to firmer ground. When the husband got out of the pickup once more to thank the two men, he realized they were gone. There were no footprints in evidence or any surface feature that could have concealed their departure. People who cross the zone regularly report seeing strange lights or fireballs maneuvering at night, changing colors, hanging motionless and then taking off at great speed. Two ranchers heading back from a festivity witnessed how a shining light floated down from the dark sky and disgorged humanoid occupants, who glowed with the same eerie light and were walking toward them. The ranchers broke into a frantic run. Physical traces of these nocturnal visits can be found. One witness returned one morning to the site where he had seen the mysterious lights cavorting the previous night, and found that the scrub vegetation "had been set on fire". Dozens of similar reports emerge from the zone, told by reliable witnesses. The growing skeptical trend in UFO research tends to overlook these interesting cases in favor of others that show a clearly military or governmental bent. The Zone of Silence can offer that as well: in the summer of 1970, an Athena rocket blasted off from the U.S. Air Force facility at Green River, headed toward the White Sands missile range in the state of New Mexico. The initially uneventful launch soon became cause for alarm as the projectile suddenly veered off course as if drawn by an external force, prompting the missile’s controllers to abort the mission in mid-flight, hoping the errant rocket would plunge into the desert on the U.S. side of the border. The command to “kill” the stages of the projectile should’ve worked, but the final stage, carrying the payload, activated itself on its own for a four-second burn, taking it straight into the Zone of Silence. A state of alarm ensued and a recovery mission was ordered, perhaps with more alacrity than usual, as the Athena carried an unusual and controversial payload. In later years it was disclosed that the nose cone had been filled with cobalt, ostensibly to test atmospheric reentry conditions. Initial concern centered around the possibility that an unfriendly radio signal had deliberately steered the rocket off-course, but no such interference was ever discovered. The possibility that the six-ton rocket and its radioactive payload could have impacted a major population in the U.S. or Mexico was too horrible to contemplate. Assisted by local horsemen and ranchers, an Air Force recovery team from White Sands entered the Zone of Silence to recover the object. Given the Zone’s terrain and its overall strangeness, the wayward payload was finally located from the air: low-flying aircraft equipped with radiation scanners finally discovered it near the promontory known as Cerro San Ignacio. It was precisely this high radiation reading in the area that prompted an even stranger incident: the Mexican government demanded that the Air Force remove all traces of debris, down to the very sand of the impact crater. Hauling away tons of irradiated sand with trucks was utterly unfeasible, so more extreme measures were taken: a dedicated railroad line was constructed to the crash site, where heavy front loaders could fill railcars with ease. Other sources claim that the sand was actually poured into thousands of fifty-five gallon drums which now sit somewhere on U.S. territory, either forgotten or more than likely associated with an unlikely “flying saucer recovery” story. Cuba: A New Year's UFO Over Havana?